When you’re ready to make the switch to pro studio monitors, there are many things you need to consider. For instance, it’s up to you to create a mix that works on a variety of speakers—one that translates to boomboxes, home and car stereos, even headphones and portable music players. So you need monitors that deliver a neutral starting point, and sound that is clear across the frequency spectrum. You also want monitors with consistent performance, so whether you’re on axis or off, cranking ’em up or turning ’em down low, what you’re hearing is accurate. And you want all this at a reasonable price. When it comes to baffle design, shape matters; it plays a role in how sound waves travel. Our baffle is precisely molded to minimize diffraction, so sound waves radiate smoothly, and are dispersed optimally. Our precision waveguide is designed to ensure broad, even dispersion, and a smooth transition between highs and lows. The result is a crystal clear image of your mix, with an ultra-wide, even sweet spot. Whether you’re in mix position or not, on axis or off, you’ll always hear an accurate representation of your mix. Amplifiers are the power behind a monitor’s sound, but they can also color it. Unlike with passive monitors, our amplifiers are precisely matched to the monitor design. Featuring our proven Class A/B architecture, the MR Monitors’ amplifiers are meticulously tuned to deliver ultra-flat frequency response, so the sound remains neutral. To compensate for room characteristics, acoustic controls allow you to adjust High Frequency and Low Frequency settings (+/-2dB). Balanced inputs allow you to get the best signal possible, but the option of unbalanced inputs mean you can connect easily to any source. And MR Monitors deliver enough power to handle the toughest source material, at sound levels beyond sane people’s requirements. A speaker’s cabinet is more than just an enclosure—it’s another component that affects the overall quality and character of the sound. Our cabinet features a rear port, carefully tuned to deliver superior bass performance with no audible vent noise. Because air passes through the precisely engineered curved port easily, there is no distortion, and no build-up of pressure within the cabinet that could affect driver movement. The rigidity of the cabinet’s precision-braced MDF construction also prevents vibration, meaning your sound is always free from unwanted resonance. 1Transducers are responsible for converting your electrical signal into sound, so consistent, unwavering performance is a must if you want sonic clarity. We specifically create our ultra-low distortion steel frame woofers and waveguide-loaded silk dome tweeters to work perfectly in concert with all the components in each MR monitor. You get a precisely tuned monitor that performs with impeccable consistency. MR Series Monitors are ideal for a variety of applications. Use the MRs to empower your mixes in the studio, or to add pro sound to your multimedia, gaming or home theatre system. You can even use them for a great-sounding home DJ rig. The MR5 and MR8 Monitors share the same design, so they function great together, too, making them optimal for multiple monitor setups—just add a Big Knob —as well as surround systems. For any applications where high quality sound and classic good looks are required, MR monitors are the perfect fit. We don’t mean to toot our own horn, but there’s a reason serious pros love Mackie gear. With every product we release into the wild—from monitors to loudspeakers to mixers—we up the ante on performance, reliability and affordability. Our innovation and commitment to great sound is why so many of our products are top sellers, and why our gear has legions of enthusiastic devotees. Okay, that sounded a little like a toot. But the point is, we make great stuff and we’re proud. And we’re really proud of our MR Series. Sure, there are lots of other affordable so-called studio monitors out there, but they just don’t cut it when compared to our MR Series—and they aren’t backed by our years of experience. Thanks to our hardworking and knowledgeable audio experts, we’ve once again set a whole new standard. 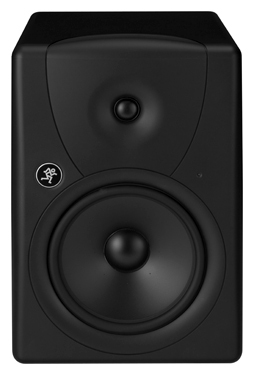 Simply put, our MR5 and MR8 Monitors sound and perform better than anything else in their class…. But with the Mackie name, what else would you expect? Go hear the difference for yourself at a dealer today.